Barcode Generator allow you to make all 1D and 2D barcode fonts, modify and resize created barcode and that are produce using different barcode font including Codebar, barcode 39, barcode 128, Ean-13, EAN-128, ISBN ,UPC, Interleave 2 of 5, 2 of 5 Industrial, PDF 417, SCC-14, SSCC-18, Code 128A, 128B and 128C, etc. 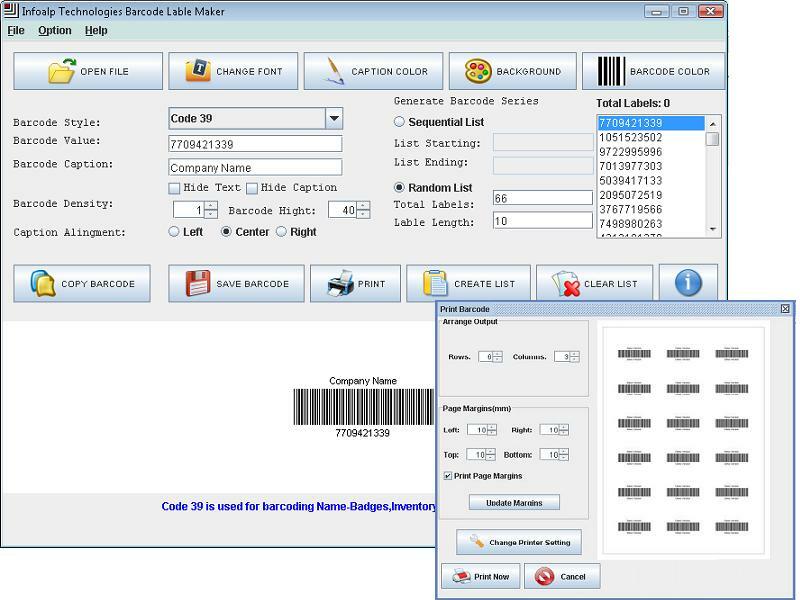 Barcode maker utility builds lists of high quality colorful barcode free of errors that is printed on paper. Barcode printer tested. ...... Barcode label creator utility is compatible with several applications including quark, Photoshop, CorelDraw etc for printing purposes. Software easily runs with all windows operating system including Windows XP, NT, 98, ME, 2003 server, 2000 and Windows Vista Ultimate etc. Barcode generator shareware provides options to change barcode image background colour, caption colour, caption font and barcode colour etc as per user requirement. Application generates printable and sannable barcodes file that can easily print barcode on any barcode printer. Barcode image creator wizard comes with inbuilt GUI features therefore anyone can easily operate this software without need of technical support or technical knowledge. Software capable to develop high resolution barcode image files and provides option to you for developing your own style barcode labels and asset tags in minimal time and affordable price. Code 39 Barcode Software for labels, sticker, ribbon asset for 22 barcode Fonts. Barcode 128 creates barcode labels, sticker, ribbon asset for 22 barcode Fonts. American barcode software labels, sticker, ribbon asset for 22 barcode Fonts. Qweas is providing links to Software For Barcode 3.0.3.3 as a courtesy, and makes no representations regarding Software For Barcode or any other applications or any information related thereto. Any questions, complaints or claims regarding this application Software For Barcode 3.0.3.3 must be directed to the appropriate software vendor. You may click the publisher link of Software For Barcode on the top of this page to get more details about the vendor.